I have struggled with mild acne ever since puberty. It definitely has improved with age and daily use of [amazon_link id=”B002LC4Z5G” target=”_blank” ]tamunu oil[/amazon_link], but just this morning I woke up with two blemishes. When you suffer from blemished skin, it definitely makes you self-conscious especially as a teenager. Unfortunately, I was on a treatment regime as a teenager that included long term antibiotic use that has left my gut unhealthy. There are other solutions. 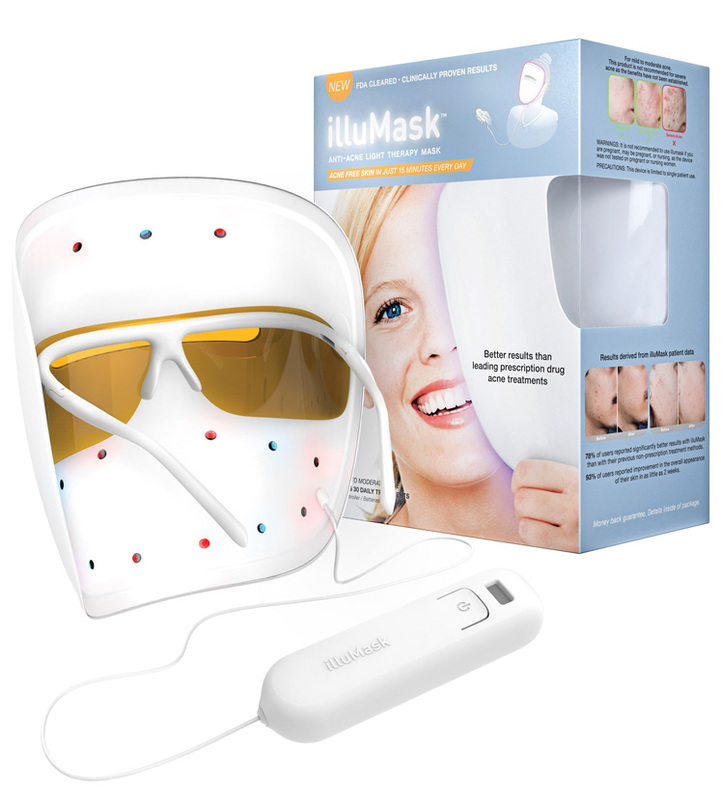 illuMask™ Anti-Acne Light Therapy Mask use specific wavelengths of red and blue light to both treat and prevent acne. Red light reduces inflammation, heals breakouts, and evens skin tone, while blue light kills acne-causing bacteria, reducing current acne and preventing future breakouts. The acne fighting light is uniformly distributed over the face. Clinical results proved illuMask™ left skin clearer, smoother, and less oily with fewer blemishes. Blue LED light therapy has been clinically proven to kill the bacteria that causes acne, Proprionibacterium acnes (P. acnes) and has been widely used by dermatologists and skincare clinics around the world. P. Acnessynthesize and store a protein called a bacterial porphyrin. Once this porphyrin is exposed to blue light, it becomes active and transfers to an excited state, this causes membrane damage and destroys the P. acnesbacteria from the inside out. Red light helps rid the skin of acne, by helping it heal and rejuvenate. Red light energy penetrates more deeply into the skin to decrease inflammation, increase blood circulation, improve collagen (skin elasticity) levels and stimulate the healing of skin tissues. The combination of red and blue light therapy has been clinically proven to be effective at reducing acne lesions. I have to admit, this feels a little gimmicky, but it has been tested in an eight week trial involving 27 patients. Results were impressive. What I don’t like about this product is how disposable it is. Each mask lasts for 30 days only. It is not designed for ongoing use, even though it is using LED lights that should last a long time. Each mask is 30 doses, which means it costs a dollar a day to use. Furthermore, our mask arrived in a box way too large full of styrofoam (not biodegradable peanuts). The disposable nature of this product really bothers me. It is definitely not eco-friendly, but if it works it is a much healthier option than the antibiotics I took for years during my teen years. When using the mask, I left my eyes open and continued to write this review. When it shut off, I did have some vision spots. I will continue to use this mask and see how my skin fares. « Are eBooks Good or Bad for Children? This light therapy masks seems like it could be very effective for treating acne as I know that when I go out in the sun or go in the tanning bed that any little pimple or blemish I have becomes less inflamed and less red. It’s been nearly a month. Any results?